Life of Jesus reflects on Jesus Christ not as a myth or an abstract idea but as God-made man, who lived in first-century Palestine in a specific religious and social context. The details of his earthly life, the Jewish culture in which he grew up, the places he visited, and the roads he traveled for a little over thirty years can today be indicated with greater precision. The Evangelists placed great emphasis on narrating the events and words of Our Lord accurately, and these help the reader to better understand and love the figure of Jesus Christ as we travel with him. Life of Jesus will take you on a pilgrimage in the footsteps of Jesus Christ as an onlooker, as if you were there in the Holy Land. Though a historical figure, Jesus surpasses history. He is the long-awaited Messiah, the Son of God. Thus, we cannot approach Jesus of Nazareth in the same way we would any other great figure of the past. The Person of Christ unfolds page-by-page in this book, pointing the way for each of us through his words, actions, Passion, Death, and the importance of his message for human existence. 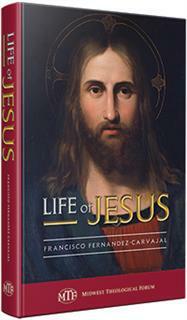 The language, archaeological findings, institutions, and customs explained in this book help us to better understand the life and times of Jesus Christ. Over forty maps and charts assist the reader in placing him- or herself in the synagogues, towns, homes, fishing villages, rivers, seas, and much of the Holy Land as it appeared two millennia ago. This book is ideal for a classroom supplement, retreats, spiritual reading, and private meditation.